A multi-tool will cut, scrap or sand depending on the fitted blade or attachment. Multi-function tools are one of the fastest growing sectors of the power tool market more and more tradesmen and DIY users discover the time saving benefits these machines can offer. Demonstration Video of the Einhell Multi-Maxx with its powerful 200 watt motor. 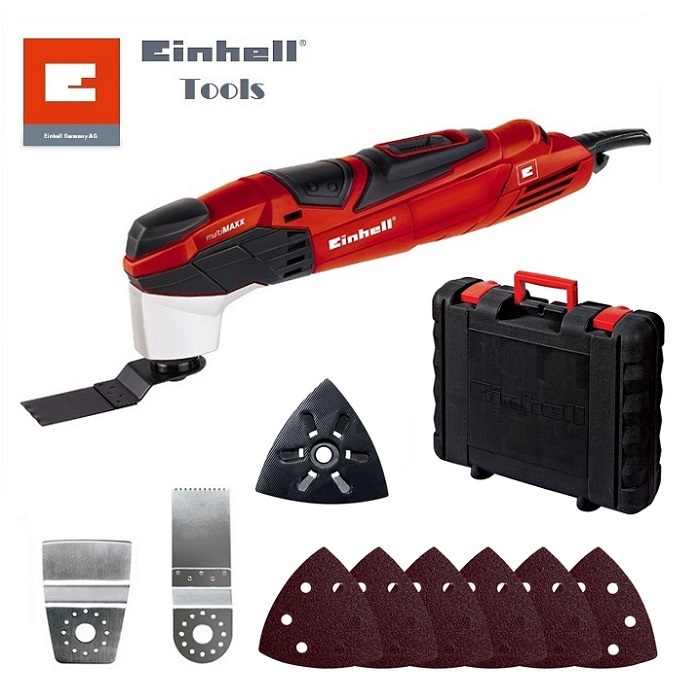 This Einhell Multi-Maxx Multi-Function Tool has been developed to incorporate the latest requirements needed by tradesmen. The body is slim with a number of soft grip zones. Both of these are critical to enable users to access restricted areas whilst maintaining a comfortable control when the machine is in use. Variable speed dial which enables you to select the correct cutting speed for the material you are working with. Blades can be angled easily, allowing you to cut in restricted areas such as between joists or struts. Changing the blade is quick and easy. Just undo the hexagon bolt with the key provided, locate the blade over the lugs at the angle you want, and re-fix the bolt. If you want to sand, simply clip the dust extraction unit over the blade holder and onto the body vents, then just attach the triangular detail sanding head in the same way as you would with a blade. You can then connect a standard dust extraction or hoover if you have the adaptor to the dust unit and you can sand virtually dust-free. Sanding sheets are of a standard design. Sanding discs are attached via a hook and loop system simply push on or pull off.